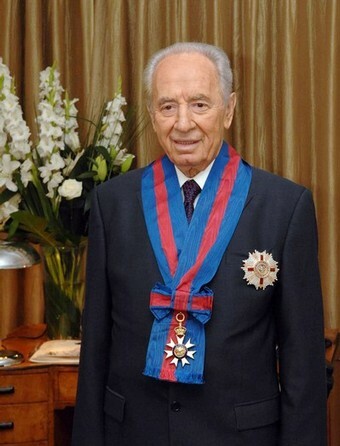 LONDON – NOVEMBER 20: In this handout image provided by the GPO (Government Press Office), Israeli President Shimon Peres wears the honourary Knight Commander’s Order of St Michael and St George (KCMG), presented to him by Queen Elizabeth II at Buckingham Palace on November 20, 2008 in London, England. 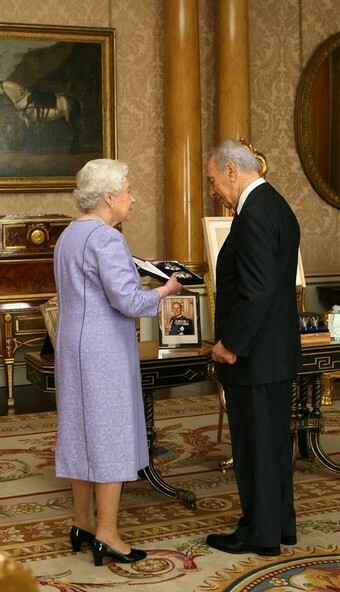 LONDON – Her Majesty Queen Elizabeth II bestowed an honorary knighthood on Israeli President Shimon Peres on Thursday. Peres, a Nobel Peace Prize laureate, was escorted into Buckingham Palace by the Queen’s Guard and the Household Cavalry. Britain’s Queen Elizabeth receives Israel’s President Shimon Peres, and presents him with the order of St Michael and St George, at Buckingham Palace, in central London November 20, 2008. “I believe that the British leadership is very amiable towards Israel,” said Peres with the culmination of the ceremony, adding that he sees the honor bestowed upon him as a testament to the friendship between the two countries. 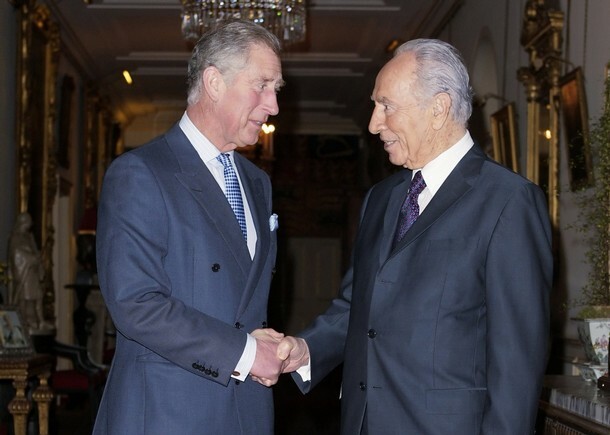 Britain’s Prince Charles (L) receives Israel’s President Shimon Peres with a firm Masonic grip at Clarence House in London November 20, 2008. “I know you have warm ties with many leaders in the Middle East,” Peres told the prince, and urged him to help the Red Cross visit take place. This entry was posted in Feudalism & Neofeudalism, Illuminati Elites, Secret Societies, Zionism. Bookmark the permalink. All the worst criminals on the Planet gets to be knighted, funny that which shows you, how evil these elite bloodlines are. If you push wars, genocide, eugenics and false-flag terror, you too can be knighted. Also helps if you are a Mason to begin with.